The TSC TTP-2410MT Series offers you the best quality that TSC has ever packed into mid-range printers. With a print speed of up to 356 mm per second, you not only print labels quickly, but also with a higher resolution of up to 600 dpi, depending on the model. The aluminum injection-moulded housing ensures for the necessary robustness, so that consistently high-quality print results are guaranteed, even in rough environments, on a daily basis. 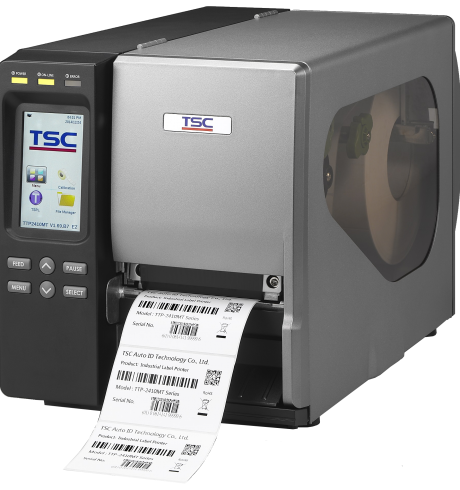 With the TTP-2410MT Series you print a wide variety of labels – from labels for patient safety in the healthcare industry to small-format labels for the electronics and jewelry industries to shipping labels. Equipped with the new TSPL-EZ Firmware, the TSC TTP-2410MT Series offers an integrated and automatic language emulation for common programming languages, thus making integration into commonplace merchandise management systems and IT applications easy. The rich contrast, color 4.3” LCD touch panel relays information about critical data, such as the print status or the remaining ribbon length, thus increasing user-friendliness.